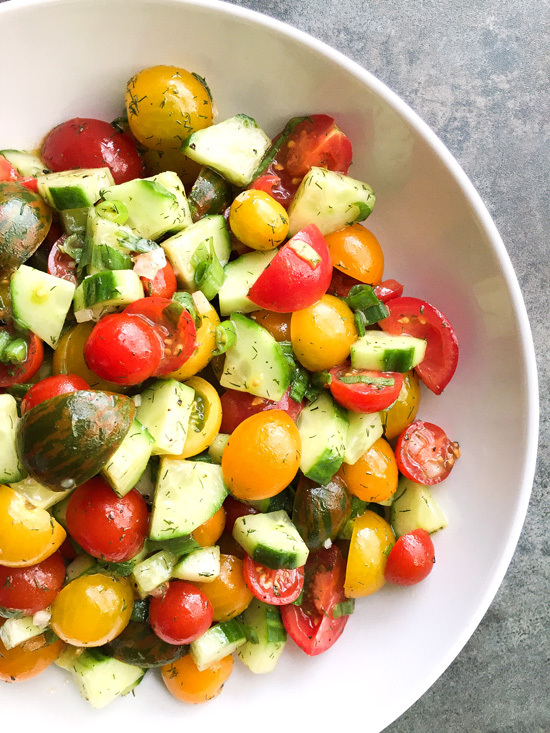 This refreshing Tomato and Cucumber Salad features a white balsamic vinaigrette dressing. It makes a tasty side salad during the hot Summer months. Super easy and only takes a few minutes to make! Using a mixed medley of cherry tomatoes also makes for a very pretty presentation. I can’t seem to get enough of these pretty cherry tomatoes lately! 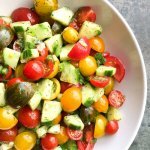 Super easy side dishes like this Tomato Cucumber Salad are perfect for the warmer Spring and Summer months. They are so nice and light, which is just what you want when it’s one hundred degrees outside. Seriously, the heat index was 109° here in DFW yesterday. Tomato salads are incredibly versatile, which is one reason I love them so much. You can create all kinds of variations of it, depending on what else you are serving. From Mexican to Italian, you can create a salad to compliment your meal. If you’re looking a delicious tomato salad with a bit of a kick, be sure to check out my Spicy Marinated Tomatoes recipe. Cucumbers were one of my favorite veggies as a kid, and I still love them. I especially love English cucumbers. I partially peeled the cucumbers, but you could peel all of it or none of it if you prefer. I just think that the partially peeled ones look pretty in this Tomato Cucumber Salad. I basically just ran a vegetable peeler down the length of the cucumber, removing half the peel. If you can’t find the mixed medley of cherry tomatoes, you can certainly use all red. Trader Joe’s has had the organic ones lately, so I’ve been buying those. I just love how pretty the medley of tomatoes looks with the green cucumbers! 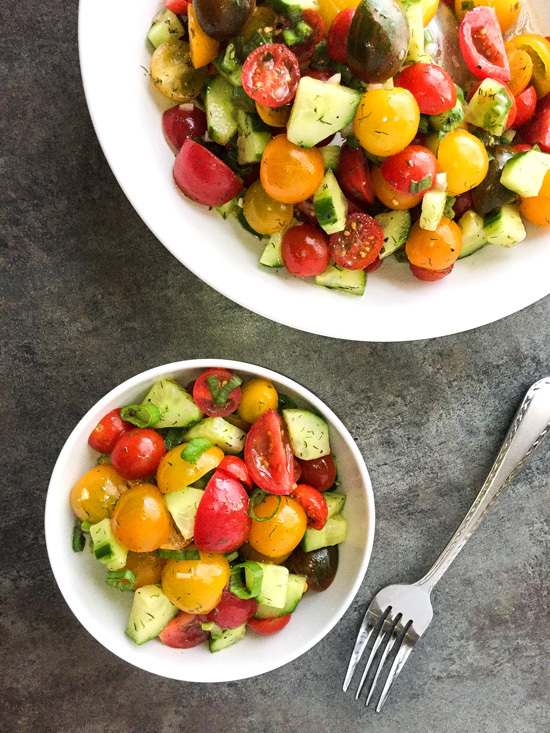 This Tomato and Cucumber Salad features a white balsamic vinaigrette dressing. It makes a tasty and refreshing side salad during the hot Summer months! In the bottom of a large bowl, whisk together the dressing ingredients. Add the tomatoes, scallions and cucumber and gently toss to combine. Serve immediately.